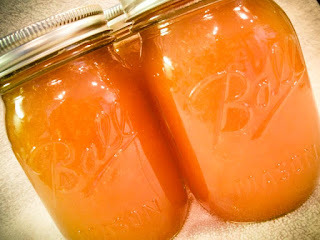 Peach Rosemary Lemonade Concentrate - - Canning Homemade! Peach Rosemary Lemonade Concentrate is the newest adaptation from Whitney based on a basic recipe from the Ball Complete Book of Home Preserving. Whitney just keeps making some great flavor combinations and I want to make sure I keep these available long after the posts on my FB page disappear. From Whitney: My suggestions is to mix it one part concentrate to three parts iced tea. Perfect! I only used five cups of sugar in this one. And since I've decided I like it best in tea, next time I will probably only use 4. In general I like really sweet hot tea, but not very sweet iced tea...I used fresh rosemary, 6 stems and steeped it while everything was heating up. I removed it before I bottled it, though. Again here is the basic recipe with Whitney's adaptations. Thank you Whitney for sharing another very special recipe with me and the canning community! In a food processor, blender or bullet puree peaches. Transfer peach puree to a stainless steel saucepan over medium-high heat. 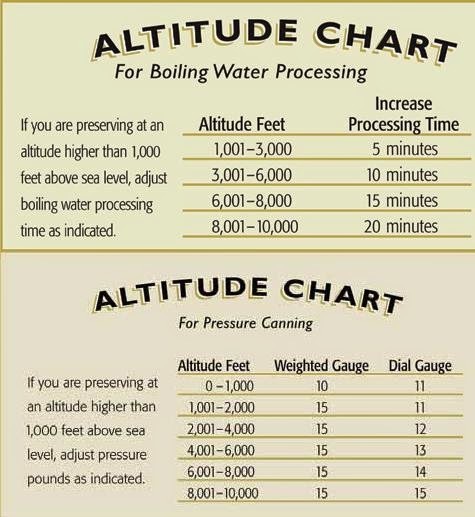 DO NOT BOIL. Add lemon juice, sugar, and rosemary and stir to combine. Using a thermometer heat to 190 degrees Fahrenheit, stirring occasionally. Because this recipe has sugar it will get to temperature rather quickly so keep your eye on the thermometer. Remove from heat. Remove rosemary before filling jars. To reconstitute, mix one part concentrate with one part water, tonic water or ginger ale. Adjust concentrate to suit your taste. Remember Whitney's idea use one part concentrate to three parts ice tea! Peach tea anyone?